Blue Effect is a wave-shooting, sci-fi horror VR game that delivers a unique, but short-lived thrill. Optimized to perfection and quite immersive, this title succeeds- where it tries. The end product contains little more than an empty shell of what it could be. Throughout four maps, Blue Effect pits you against waves of demonic aliens, which use various flanking strategies in their unrelenting hunt. The extreme darkness in the environment brings a challenge, as rooms are often pitch-black and impossible to see more than a few feet forward in. Darkness not only gives Blue Effect its challenge, but makes the experience terrifying at times. This fear-factor, relying almost entirely on the darkness, is unfortunately short lived. As a 180° wave shooter, where enemies only appear in front of you, they grow predictable before you even finish your first game. After a minimal amount of gameplay, generic jump-scares from sneaky enemies I hadn’t noticed are the only moments that still scare me. While thrilling, this game’s “horror” value wears off far too quickly. To fight off aliens, you’re given a pistol and an orb launcher. The pistol kills enemies quickly but has no recoil or reloading, making it overpowered- while shooting it feels like using a weak pea-shooter. The orb launcher, designed using accurate ball-throwing physics, is effective at killing enemies. However, it’s generally more useful as a method of illuminating the environment. Shooting orbs mid-air causes them to explode, and while this doesn’t damage enemies much, it helps make them more visible. Doing this requires skill, but becomes easy with practice. There are also limited, throwable power-ups in some levels that grant the player temporary night-vision; while their execution feels cool, using them takes away any ounce of difficulty that the game otherwise has. 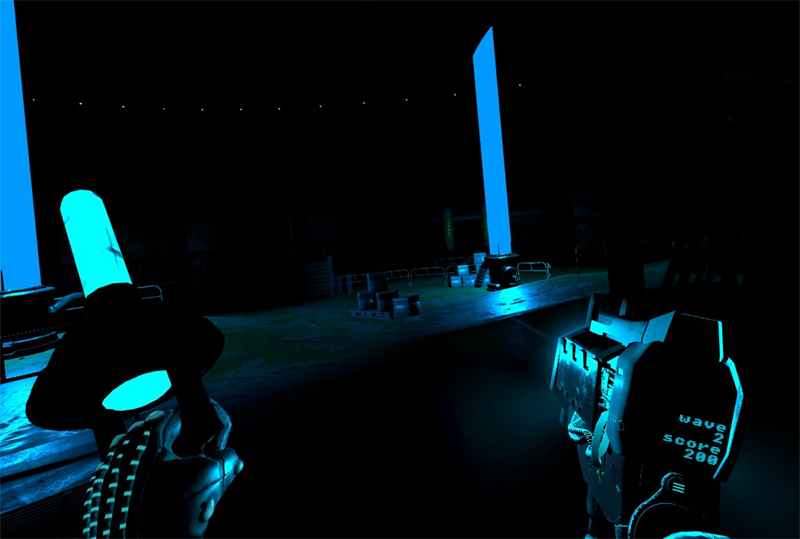 Like many other VR wave shooters, Blue Effect falls victim to a severe lack of content. The game is entirely an endless survival mode, devoid of any compelling objectives. Three of the game’s four maps (with the exception of a train sequence, which I enjoyed) are almost identical to each other. Worse, two of these bored me out of my mind. Every level can be switched to Halloween or Christmas themes, but this mainly just changes your orbs’ skins (to jack-o-lanterns or snowman heads, respectively) and adds virtually nothing to the experience. The pistol and orbs are your only weapons, with no variation whatsoever. While the four enemy types approach combat differently, their behaviour is so predictable that after minimal time playing, I stopped feeling even slightly intimidated. With monotonous, repetitive, and largely unchallenging gameplay, the game quickly turns into a chore and provides almost no incentive to keep playing. Blue Effect’s narrative doesn’t do it any favors. In the tutorial, you learn that the gun and orb launcher are both powered by a mysterious new technology called the “blue effect.” This is the only context you’re given, failing to indicate the protagonist’s role or why aliens are attacking. Make no mistake- I believe that good shooters don’t necessarily need fulfilling stories. Considering how much the developers hyped up this game’s story on its Steam page, however, the lack of any proper context feels bitterly ironic. Blue Effect compensates for its lack of content with a local multiplayer mode, which is extremely fun and makes up the most enjoyable time I’ve spent in the game. 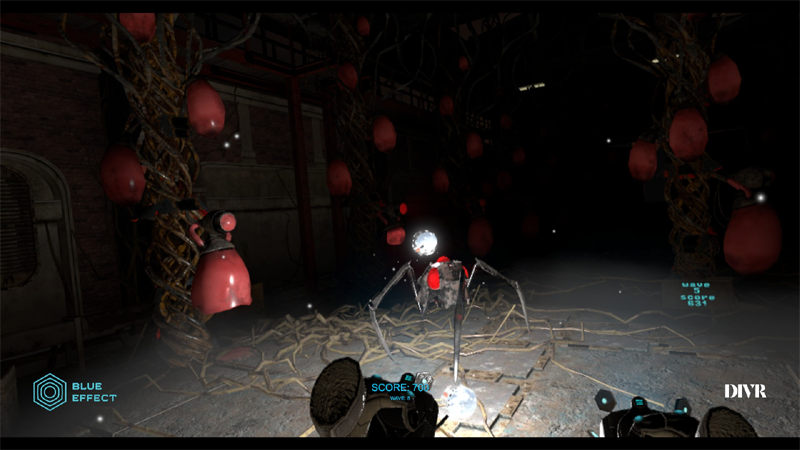 One player, in VR, defends against monsters controlled by a player on mouse and keyboard. Although this isn’t much less repetitive than the main game, a bit of friendly competition works well here. This mode is exciting, balanced, and easy for anyone to pick up and play. In my experience, Blue Effect’s multiplayer simplicity makes it an excellent party game to show off VR in. The only flaw is a UI glitch where the PC player’s cursor icon is always visible on the screen, making aiming feel awkward at first. 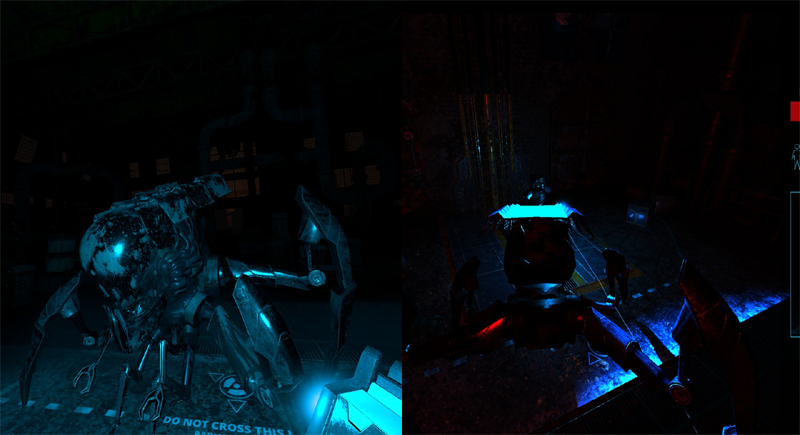 Blue Effect has beautiful graphics, with dynamic lighting and detailed textures. In spite of this, performance is always butter-smooth and the game is well optimized. This is taken further with an excellent user interface: the menu can be summoned at any time, with holographic buttons and all the options you could want. Even though Blue Effect has an informative tutorial, its controls are very simple and require little explanation. It’s also worth mentioning the game’s superb sound design, which often spooked me more than the enemies themselves. But what would I pay for it? A shallow, and generic wave shooter, Blue Effect gave me just under two hours of play by the time I’d played every level multiple times. Local multiplayer is the game’s saving grace, but even this soon loses its charm. I wouldn’t suggest paying more than five dollars for Blue Effect, maybe ten if you’re particularly interested. DIVR Labs provided theVRgrid.com with a review code for this game and, regardless of this review, we thank them for that!